The Community Reinvestment Act (CRA) was enacted by Congress in 1977 for the purpose of ensuring that financial institutions are accommodating the needs of their entire community including low to moderate income neighborhoods. 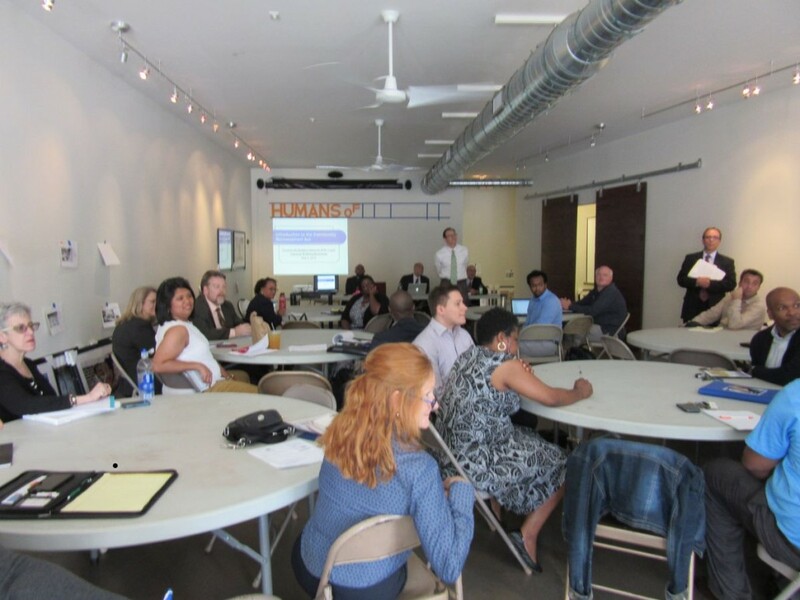 Financial institutions and community-based organizations in the St. Louis region recently embarked on a capacity building initiative that will result in concrete community projects fulfilling those CRA goals. The CRA Ladder of Capacity Building is the first initiative in the launching of Invest STL, the new regional initiative designed to bring a stronger, more collaborative system of community development and investment in St. Louis. The Ladder of Capacity Building, developed by the Community Builders Network (CBN), Rise, and Midland States Bank, is designed to create new community development opportunities for financial institutions and community-based organizations. The capacity building initiative plans to pair together financial institutions and community-based organizations to design projects that serve low- and moderate-income communities. By pairing these two groups of actors together, the CRA Ladder of Capacity Building will build relationships between investments and innovative projects in communities. Four phases of the CRA Ladder of Capacity Building program have been defined, with the first phase already having occurred on May 5, 2016. The first phase of the program was a workshop that explained the basics of what the CRA is, how financial institutions can remain faithful to the CRA with the help of community-based organizations, and what financial institutions are looking for in projects and partnerships. Since the first workshop, a webinar was held on May 24, 2016, to help participants better understand the capacity building program and prepare themselves for the next phases of the program. The second phase of the program will consist of a “speed networking event” on June 23, 2016. This will result in pairings between financial institutions and community-based organizations. Proposal development (with assistance from Rise, CBN staff, and bank partners) is the third phase of the program. The purpose of this phase is to construct fully developed project proposals by the community organizations and financial institution teams. The final phase of the program will consist of a showcase of the proposals by the community organizations to a judging committee. Winning proposals will receive funding awards of up to $10,000 (the funding awards were made possible by Midland States Bank). Throughout this capacity building process, young professionals interested in community development are supporting the capacity building ladder and participants as they develop CRA eligible proposals. Rise is matching interns in their Rising Stars Program with participating community-based organizations to add to their capacity and to provide graduate student interns hands-on community development experience. Rise and the Community Builders Network of Metro St. Louis are working to facilitate the remaining phases of the CRA Ladder of Capacity Building, resulting in community organizations and financial institutions implementing community improvement projects in the St. Louis region. Lemay Housing Partnership’s Tasting for Change 2016 4th Annual Rise Up Festival – Celebrating Revitalization in St. Louis!